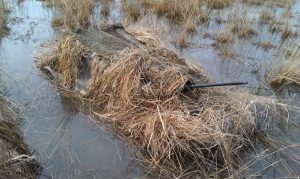 Duck hunting blinds are camouflaged shelters to conceal the duck hunter from ducks and other waterfowl when hunting. The blinds can be permanent or temporary. Meant to hide hunters, so ducks do not notice their movements, some blinds are on land while other blinds conceal a hunter’s boat, vehicle, dog, motor, and other items. There is an almost limitless selection of blinds for hunting over water. Hunters can make their blinds from natural material such as native grasses and vegetation or buy camouflage blinds. Many public areas prohibit permanent blinds, so hunters use temporary blinds when hunting in these areas. Ducks have excellent vision so blinds should conceal the hunter while blending into the surroundings. In some cases, the natural cover is dense and high enough to hide under, but ducks will detect movement so the hunter must stay still. Permanent duck hunting blinds are usually the most comfortable but building and maintaining the blind is labor intensive. One disadvantage to a permanent blind is that if the Ducks change positions in a body of water, which they often do because they have exhausted the food supply, the wind switches, or the hunting pressure increases, you are not mobile. Hunters with portable blinds easily transport them and set up fast. Some types of portable duck hunting blinds include a cameo mesh blind that you drape over poles. You can use this blind both on land and over water to fool the ducks. One-man collapsible blinds have an observation window and a seat, which conceals the hunter completely. The hunter collapses the blind by stepping on a pedal when the ducks are close enough to get a clear shot. Collapsible boat blinds work the same way except they cover the entire Jon or duck boat. Fiberglass one-man coffin blinds are low profile, and the hunter stays down by inclining on a backrest. A giant goose, magnum decoy blind with viewing slots, hides the hunters by having them blend into their spread of decoys. Some of the many permanent duck hunting blinds available include the stilt and box blinds. Theses blinds normally have bench seats, wooden floors and corner posts. Chicken wire covered with vegetation hides the hunters. Box blinds are on land whereas still blinds are set in the water. A boathouse blind is similar to a collapsible boat blind because it covers the entire duck or Jon boat and the hunters. It is almost like a portable garage because they drive big posts into the ground with an end opening for the boat to slip out of to recover downed ducks. There is also a door for easy access to a hunting platform.